11 by 11 on mat board. Food coloring and shaving cream, colored markers, pens, and pencils. Watercolors. 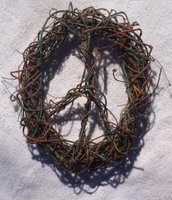 Peace and Love, Hippie Art from a Saturday morning memory. Love the words that go with this hippie art Siungleton... so true. A balance between night and day, cool and warm... I love it! But can one be in the wrong time and place and, yet, be at peace? I think the peace part makes the time and place feel just right . . . Here and now, baby . . . right where I need to be . . . at one with the divine flow . . .
And thoughts stir to give birth to colour." the world in one piece! Wonderful!! 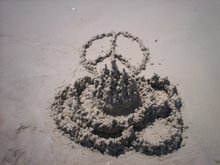 Thank you for sharing and bring peace to so many!! May it one day, make the world go round!